Unmistakeable. Overall colouration white with pink tints. Coverts red and remiges black. Legs pink. Bill flesh-pink, black at the tip. In flight, very long neck and legs extended. Juvenile: white with grey-brown tints, without pink or red. Voice: cackles like a goose. L. 120-145 cm ; W. 140-170 cm. 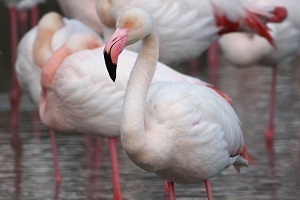 Similar to the Greater Flamingo but distinguished by the smaller size, a shorter, thicker neck, some pink feathers of the upperparts with red streaks, pink eye, and dark red bill with a black tip. 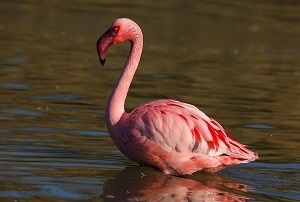 Juvenile: grey-brown like juvenile Greater Flamingo but bill all dark. Voice: low murmuring “murrrh-murrrh-eh” on the ground, or a “kwirik” in flight. L. 80-90 cm ; W. 90-100 cm.